The other week I saw an Instagram link to a website offering Instax cameras at incredibly discounted prices. I hastily bought one, chuffed I’d got a great bargain. How happy my daughter would be unwrapping it on Christmas Day. My glee was short-lived. My credit card history showed I’d paid a weird company in Singapore. I started to worry. A bit of googling later I found the genuine Instax website with a warning page about fraudulent ones. I’d been scammed. The camera is never going to be delivered. I felt cross. Cross that people would do this to me and annoyed with myself for falling for it. Fortunately it wasn’t a lot of money but the experience has brought home to me the potential risk of buying things on the internet. In the future I’ll be more wary before I press the ‘Proceed to Payment’ button. It has also prompted me to look into what you can do to keep safe when booking holiday accommodation online. Fraud is rare but unfortunately does sometimes happen. It can happen whether you book through an Online Travel Agent (OTA) like Owners Direct or Airbnb, or book directly with the owner. Anyone can set up a listing on one of the OTAs in minutes, with no checks. A little longer and a bit more technical know-how and they can set up a basic website. The perception seems to be that you are safer booking through an OTA but arguably an owner with their own quality website is less likely to be fraudulent. They have taken the time and effort to set up a good website. Look through the website or listing thoroughly. Does it have plenty of information and decent pictures? Check that email addresses match the property name and /or the web address. Google the online presence of the property. Make sure all the details, photos and contact details are high quality and are the same everywhere. Check social media. Is there a Facebook page for the property? Instagram is getting ever more popular these days. Has the owner verified the property on Google My Business? A scammer is unlikely to have set up much of a social media presence but a genuine owner will often make the effort. Contact the owner. If a phone number is provided, give the owner a ring to have a chat about their property. Ask lots of questions. A genuine owner will be happy to answer and will have a good knowledge of their property and the area. Use common sense. Is the price reasonable for the property and doesn’t sound too cheap perhaps? Are you feeling under pressure to book quickly? If an offer seems too good to be true, it probably is. Thinking back to my dodgy camera website, a little voice in my head was telling me it sounded an unbelievable offer but I wanted to get that bargain quickly before they all sold out. So, don’t be like me, take your time and do some research. Most importantly, trust your instinct. If you feel uneasy, just walk away. When it comes to handing over money many owners, ourselves included, can take credit cards, which gives you similar payment protection to that offered by the OTAs. Travel insurance also gives you added protection (check what is covered). Keep Calm & Book Direct! Please bear in mind that fraud is rare. The intention of this post isn’t to scare anyone away from looking to book direct. With no middlemen you save yourself a booking fee and owners don’t pay a hefty commission so they can ensure you get the best possible price. You support your independent holiday home owner too. It’s just a reminder to stay savvy to ensure you stay safe. A couple of days between cottage bookings gave me the chance to go and stay there myself earlier in the week. And it was hot, hot, hot. I spend a lot of my time outdoors giving the back garden a bit of a spruce up. Jet washing was a very messy business, I think I got myself as wet as the backyard. Then a bit of chopping back some invading shrubs. Plus a quick battle with the garden mint. It seems to be on a mission to take over the whole patch. I also added a couple of new plants, sadly accidentally unearthing some spring bulbs in the process. Each visit I’m on my hands and knees pulling up weeds growing between the paving in the back and through the gravel in the front. And next time, oh look, more weeds. But I can’t put weedkiller down. We have hedgehogs visiting the Row quite often and in late summer lots of butterflies are attracted by the windfall apples in the front garden. Well, as Eeyore said, weeds are flowers too, once you get to know them. When digging a hole for a new plant I found the biggest nail I’ve ever seen. 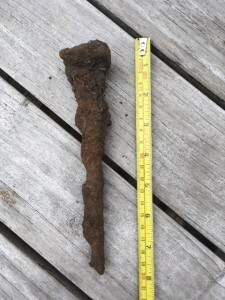 It is almost 20cm long, very rusty and looks old. Martin said that once upon a time it would have held down the decking on a wooden boat. In the 19th century West Bay, then called Bridport Harbour, was an important centre for shipbuilding. The largest vessel ever built in the shipyard weighed 1,460 tons and was over 60m long. I wonder what size boat this nail came from? The seaside was lovely in the late afternoon. I watched people paddling in the sea at West Beach while I savoured my reward (for all that hard work gardening) of a Baboo Gelato ice-cream. Followed by a Cornish pasty from the bakery. Perhaps not the conventional order to eat them in. That’s one of the good things of being somewhere on your own, you can do whatever you want whenever you want! If you are staying in the cottage help yourself to the mint and rosemary. If you notice any of the plants looking parched please do water them. Why is it that the plants you want to keep need TLC whilst the weeds seem to thrive on neglect? There were a couple of interesting additions to the cottage too. See the photo above. It’s a new picture for the twin bedroom made from vintage playing cards. Also, we replaced the old TV with a new one. This time bigger and SMART. 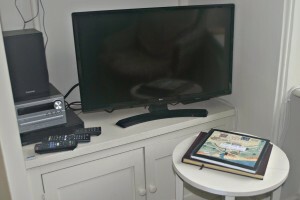 Plus there’s a separate DVD and Blu-Ray player there now. We did get time to try out a couple of places in Bridport we’ve never visited before. An Asian food restaurant called Dorshi and a friendly pub, the Tiger Inn. We enjoyed them both and look forward to returning on another trip so I’ve added them to our Fantastic Food and Drink page. Welcome To Our Brand New Seagull! A while ago I tried to draw online a seagull to sit on the lifebuoy “o” in the “West Bay Cottage” logo at the top of the website. It wasn’t as easy as you might think. After quite some effort I was rather proud of my bird. I’d look fondly at him whilst pottering around on the website. There he was, squawking away happily. But oh, the abuse the poor thing got from friends. “What’s that?” “It looks like a dinosaur.” “A pigeon?” “Why hasn’t it got any wings?” etc. etc. The fact I’d actually traced online a photo of a real West Bay seagull didn’t appease anyone one bit. Even my husband, who knows better than to criticise such things, said he “wasn’t sure about the seagull”. Obviously a seagull only a mother could love. So, ta-dah, welcome to our brand new seagull. The old squawking one is no more. I showed my husband. “Nice…. I miss the old one”. So do I, so do I. Why Book Directly With The Owner? Increasingly online listing sites such as AirBnB, TripAdvisor and Owners Direct (a misnomer if ever there was one) and holiday letting agencies are charging owners sizeable commission and guests heavy booking fees. It’s a win-win situation for them and a lose-lose one for guests and owners. They are also making it more and more difficult for the potential guests to communicate with owners. This ensures they can’t be bypassed before they grab your money. But what a shame. Who knows the accommodation and local area best? The owner. The obvious person to ask questions to make sure it’s the right accommodation and the right destination for you. So, how do you avoid steep online fees when booking your holiday? Just book direct. Save money and get a personal booking service. Look for niche sites which cater for either a type of holiday (e.g. dog-friendly holidays) or a particular area. The site we use, www.westbay.co.uk is a great example of this. It has lots of information about the area and listings for cottages, apartments, b&b’s etc. It’s aim is to be informative and helpful, not to make money. Use Google wisely. Type in the area you are interested and a few suitable words like “self catering” or “holiday” or “cottage”. Scroll past the first page or two. These are dominated by the big online travel agencies (OTAs) who have the marketing budget. Then click away. If you use Facebook there are a growing number of groups for owners to advertise their holiday accommodation. Try Book your Holiday Direct with the Owner for properties in the UK and France. Local tourist information sites such as Visit Dorset have lots of information about your preferred area as well as listings for accommodation providers, restaurants and local businesses. Have a look at simple listing sites like Owner Holidays, Dorset Holiday Cottages, The Holiday Let and Independent Cottages. These still allow you to contact the owner directly and book with them privately, just like the original idea behind Owners Direct before they were bought by HomeAway. Be a detective! Look for the name of any property that takes your fancy on one of the OTA sites. Many owners have dropped hints in their listings about their own websites. Then google the property name to find the owner’s website. TripAdvisor also have some ‘direct booking only’ listings but they are usually at the bottom of a search list. Look for the ones that do not say ‘payment protection’. These owners pay a subscription to list their properties instead of TA taking a commission per booking from guests. On some OTA sites you can still communicate in advance of booking. Make an enquiry rather than going directly to ‘Book it Now’. Ask owners if they are willing to book with you privately. If it worries you that you are not booking with one of the “big names” you can always give a property owner a ring to have a chat about their property. If they have plenty of information on their website, a Facebook page and some other listing sites, then this, supported by a phone conversation, should reassure you that they are genuine holiday homeowners. Many owners, including ourselves, can take credit cards, which gives you similar payment protection to that offered by the OTAs. Next time you are hunting for a holiday please give these suggestions a go. Save booking fees and a whole heap of commission and support your independent holiday home owner to boot!